Every time i invite someone for brunch or afternoon tea time, this quiche and some green salad is the best and easiest menu for me. 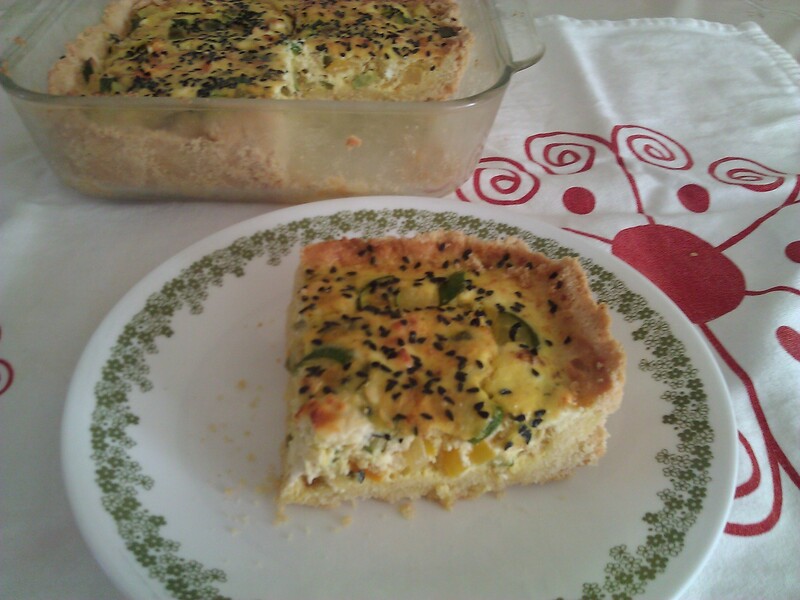 If i am planning to go on a road trip with my husband, we start the day with this quiche as a breakfast (very fulfilling and lasts for a while) and take the rest for the road :) . That is true. I wanted to give the correct recipe (PERFECTION), but it took me months to write it (NO PROGRESS). Because i wanted to make the quiche first and measure them. Unfortunately i could not do that too. So I will try to give you the measurements of the ingredients as much accurate as possible. 1- Start with cooking the vegetables. Saute peppers and onion with oil and salt. Once they are almost translucent, add zucchini. When they are all almost cooked (soft) add black pepper and remove from heat. Let it cool a little bit. 2- While vegetables are cooking, combine the crust ingredients (except water) in a bowl. Add enough water to allow the dough form a ball and cleanly leave the sides of the bowl. Press the dough in 9″ pie/quiche pan, make sure the sides are high enough. Prick the dough with a fork in several places. Don’t forget the sides! Put a parchment paper over the dough and put some beans (ex: garbanzo beans) on the paper. Bake in preheated oven: 400F, 10 minutes. Remove the parchment paper and the beans and bake 5 more minutes if needed. 3- Spread the cooked vegetables into the quiche crust. Sprinkle the cheese, cover the surface of the vegetables. 4- Whisk the eggs and half & half in a bowl. Pour over the cheese. Make sure the egg mixture is enough to cover all the vegetables. You can use a fork and try to make sure that egg mixture goes in between the cheeses and vegetables. 5- Bake for 30-40 minutes or until center is just set. 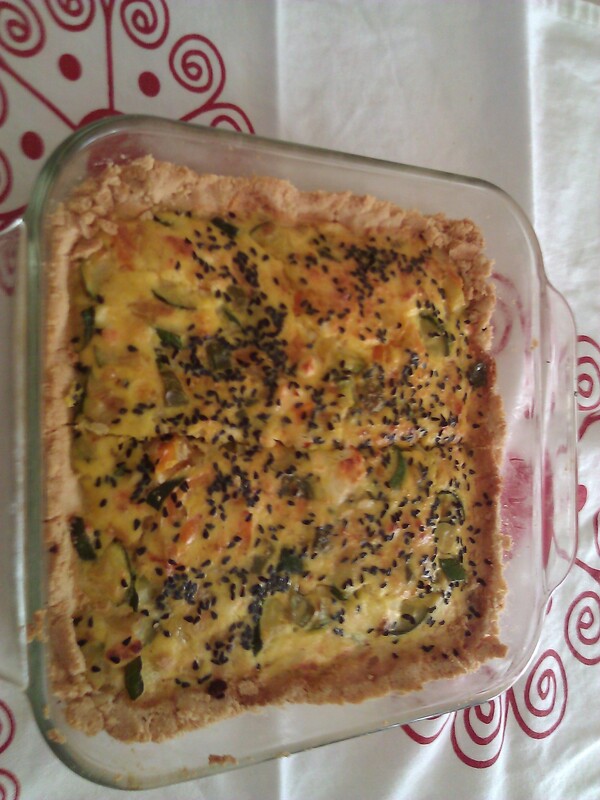 – Fill the quiche crust with cooked vegetable and cheese all the way to the top, but do not forget to leave a little space for egg mixture. So if you need to add more vegetables, please do so. 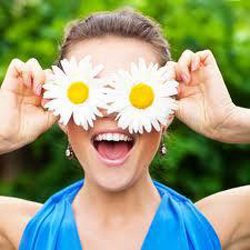 – If the egg mixture is not enough to cover the vegetables, add more half & half. -If you think your quiche looks dry, you can brush it with olive oil (not the crust). -While serving, you can garnish your quiche with diced green onion and tomato with a side of spring mix salad dressed w/olive oil+balsamic vinegar. I hope you like my easy, light, Gluten-free, vegetarian quiche too.